While Independence Day: Resurgence has had quite a highly enthusiastic marketing campaign to entice worldwide audiences, especially Chinese moviegoers, into the theaters, the film itself has fallen far from the mark. Having premiered both in the Chinese mainland and North America on Friday, sci-fi sequel Independence Day: Resurgence saw weekend earnings of 192.86 million yuan ($29.16 million) by midday Sunday at the mainland box office. Though not a bad haul, the film lost to magic heist film Now You See Me 2, a far less visually spectacular film from a lesser-known director. While Resurgence features a world-wide war between humans and aliens, its true enemy in reality is another Hollywood film, Now You See Me 2. Resurgence is one of four films released Friday. While fierce competition for moviegoers' wallets was inevitable, Resurgence and Now You See Me 2 have stood out from the pack. Yet, Resurgence has been just one step behind Now You See Me 2 throughout the weekend. According to data from box office tracker China Box Office, the two films' midnight showings earned 3.19 million yuan (Now You See Me 2) and 3.10 million yuan (Resurgence), while opening day saw the magicians conjure up 88.55 million yuan to the aliens' 71.49 million yuan. When it comes to number of screens, both films have been on pretty much equal footing. According to China Box Office, the screen shares of Now You See Me 2 versus Resurgence during their first two days sat at 31.39 percent versus 29.13 percent for Friday, and 32.73 percent versus 28.42 percent for Saturday. It is no exaggeration to say that Resurgence is one of the first-rate visual blockbusters to come out of Hollywood in recent years. While the appearance of a huge alien mothership and a scary alien queen is really nothing new for today's Hollywood blockbusters, Resurgence's use of 3D is really outstanding: Audiences are taken into the scenes, and even though they know everything is CGI, they are still left stunned by visuals that make you feel like you are really there. It can actually be a bit discerning, because during catastrophic scenes that are supposed to be sad and make you feel sorry for those that are killed, you are actually left wanting to see more destruction as cities are pulled into the sky and then dropped or a deadly ocean storm flips over freighters. Yet, visuals can only carry a film so far. 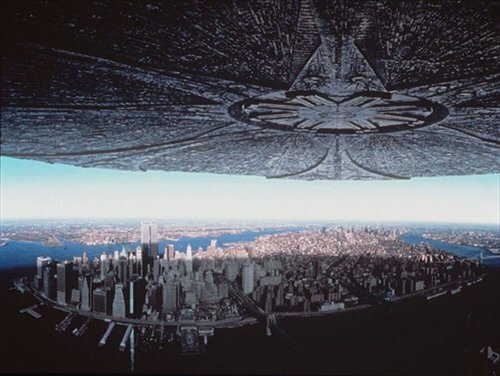 In the new movie, it has been 20 years since humanity defeated the alien invasion that took place in Independence Day, a long enough time for some major changes to the global political and economic situation. Whether out of a market considerations or just a reflection of reality, China is given an important position in the sequel though the US still takes the lead. The moon base in the film, which was built by China, has a Chinese commander and a few Chinese-made products can be seen. Additionally, one of the secondary-characters who joins the fight against the aliens is a female Chinese pilot. China's importance is so great that even the aliens know to destroy a Chinese city together with other famous landmarks such as the White House in the US. Marketing for the film has been strong. At a marketing event held in a Beijing shopping mall, organizers did everything they could to make attendees feel like they were in the film. Models dressed like pilots were standing around and a model of a Moon Truck were at the event. People were even able to get cartons of "moon milk," the same milk on hand at the moon base. However, this still wasn't enough to satisfy Chinese audiences. Yang Luyang, who is currently working on a domestic sci-fi film project as part of the film crew, described Resurgence as a film that combines "a dumb plot and a series of scenes paying tribute to the first film" after he watched the film Sunday. "It is the sunset of mainstream US sci-fi blockbusters. I think there will be fewer such investments in the future," Lu told the Global Times. "Sci-fi films have existed in the US for more than half a century now. Films about aliens invading Earth bring few new things to the table. So people will be reluctant to invest a lot of capital into such projects." A lack of sympathetic characters is another one of the film's fatal flaws. While it is exciting to watch the battles on screen, the film does little to make you feel worried about these characters who are putting their lives on the lines, as such you really don't care when they barely manage to escape a situation alive. "I still remember that feeling when I watched the first Independence Day more than 10 years ago. I really resonated with it… especially when the president made that passionate speech. It was really uplifting and impressive," posted Snowflake, a netizen who gave the film three out of five stars on domestic film website movie.douban.com, adding that his lack of connection may be because he has watched too many Hollywood blockbusters recently. "London Has Fallen, Captain America 3, X-Men: Apocalypse, Alice Through the Looking Glass and Warcraft… they have repeatedly shocked my visual senses to the point they have all started to feel the same," Snowflake wrote. While Chinese audiences still admire Hollywood's special effects, people are becoming numb. It seems that Chinese audiences are looking for something that can appeal to their hearts instead of their eyes and ears.